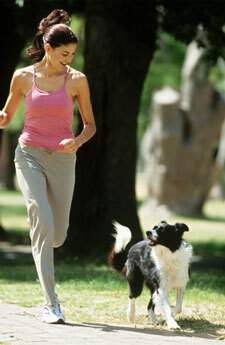 Exercise with your dog – your body and your furry friend will both thank you! Many people believe that they have to exercise for an hour everyday, sweating profusely, in order for the exercise to be beneficial. However, that is simply not true. There are plenty of low-tech alternatives that help you lose weight and stay healthy. Jump ropes arent just for kids. In terms of getting the cardiovascular system revving, this is one form of exercise that cant be beat. This is one calorie burner that works every muscle, delivering a full-body workout that slims and tones. Get a dog and take it for long walks! In one study, people who walked their dog 20 minutes a day, five days a week lost an average of 14 pounds in a year! Something about that companionship that sure beats walking on a treadmill. Get enough sleep. Research has found that sleep deprivation increases cravings and decreases the amount of leptin in your body  a hormone that helps burn more energy. So dont skimp on sleep if you want to slim down. and keeps you going. Its a distraction from the physical energy you are expending, so it doesnt seem as though you are working as hard. The result: you stick with the exercise routine longer when the music is cranked up. Invest in a gym ball. This provides a fun way to improve flexibility, balance, strength and tone. They also help you lose weight! You dont have to get fancy to exercise, and you certainly dont have to join an expensive gym or spa to get the same benefits. Get a good nights sleep, leash up your dog, turn up the volume on your iPod, and get walking! For more information about easy ways to lose weight and stay healthy, contact one of our member chiropractors today!